Background: Entropy can be used to detect the complexity of Sequences. various concepts of entropy appeared, such as metric entropy, Kolmogorov-Sinai entropy, Renyi entropy and topological entropy. Topological entropy is a difficult definition used to decipher the structure of DNA sequences, due to finite dimensional problems. Method: Different from the generalized topological entropy, a vector topological entropy is presented, which is based on the idea of multi-scale analysis of DNA sequences. Subsequently the complexity of promoter regions between Chromosome X and Y is detected by the use of a quantity topological entropy. Results: It is shown that the quantity topological entropy of promoters is less than the coding regions in all the Chromosomes. The mean of topological entropy of promoters is 3 standard deviations higher than the mean of coding regions in Chromosomes. 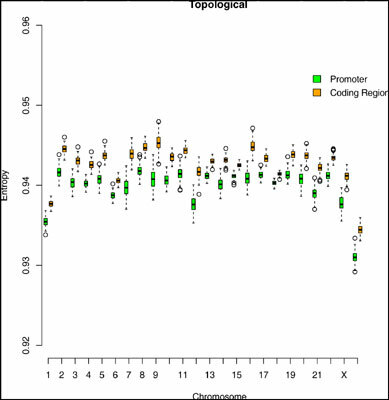 The results show that the quantity topological entropy of coding regions is significantly higher than that of promoters. Conclusion: The topological entropy is a useful tool for detecting the structure of DNA sequences, and the result of the comparisons shows the promoter regions as being more regular, which implies that the promoters are more functionally important. DNA sequence, topological entropy, promoter sequence, coding regions, metric entropy Kolmogorov-Sinai entropy.